Senior Communication major with an emphasis in Journalism & Broadcasting at Washington State University. Avid fan of the Seattle Seahawks, Seattle Mariners, and Washington State Cougars. Obliteration by Stanford left few smiles in Pullman, at least until Cougars coach Mike Leach saw “The Popcorn Guy” video. After 55-17, take what you can get. PULLMAN — Bright spots for the Cougars were few and far between in the 55-17 shellacking at the hands of No. 5 Stanford in the annual Seattle Game. The undefeated Cardinal excelled in all three phases – they outgained WSU 560-373 — and made plenty of big plays early to bury a foe that simply did not look ready for prime time in front of an announced 40,095 fans on a blustery Saturday evening at CenturyLink Field. Late-game showers and a fierce passing attack led by Stanford quarterback Kevin Hogan (16 of 25, 286 yards, three TD’s) and wide receiver Devon Cajuste (four catches, 115 yards, two TD’s) crippled any chance of an upset. 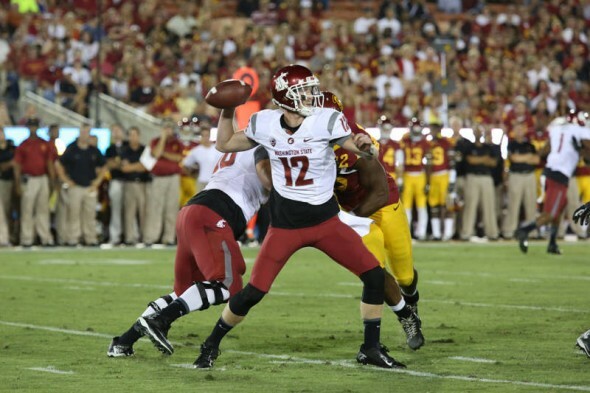 Quarterback Connor Halliday played well until the third quarter, when he released a deep ball down the left sideline before a Stanford defender slammed him to the ground. The pass was picked easily by safety Jordan Richards, who returned it 30 yards for a touchdown. Halliday limped off the field. He tried to return the next series but was unable to walk, so trainers escorted him to the locker room. Coach Mike Leach doesn’t discuss injuries, but Halliday was able to practice with the team Sunday night. During his press conference Monday, Leach refrained from naming a starter for Saturday but praised Halliday’s desire to get back on the field. “I think Connor is tough to begin with and I actually expected him to be at practice,” he said. Redshirt freshman Austin Apodaca replaced Halliday and hiccupped early as a screen pass intended for wide receiver Dom Williams was intercepted by linebacker Trent Murphy and taken 38 yards for the score. Apodaca recovered however, finishing with 15 completions on 29 attempts for 138 yards and the first two touchdowns of his career. If Apodaca plays against Cal (1 p.m., Fox Sports One), Leach seems to have no reservations. Despite the loss, a prevailing narrative being echoed in Pullman Monday by players and staff alike is to learn from the loss, not dwell on it. Although Stanford had just two sacks, there was a concentrated effort to rush and hit WSU’s quarterbacks in the pocket, which led to errant passes and miscues. Leach will see a familiar face patrolling the opposing sidelines for the Golden Bears when the Cougars take the field in Berkeley. Head coach Sonny Dykes worked under Leach for eight years and at two universities, Kentucky and Texas Tech. Leach said the two are on friendly terms and speak with each other at coaching functions. “We go way back. He was my graduate assistant at Kentucky and I hired him at Texas Tech so we spent a good amount of time together,” Leach said. Upon entering his press conference Monday, Leach had not seen the now-infamous “Popcorn Guy” video in which a clearly fed-up Cougars fan in the stands was caught by television cameras as he poured a bag of popcorn all over himself. It already has a quarter-million views on YouTube. Leach was shown the video by a member of the media and playfully remarked, “That guy is awesome. I think I kind of felt the same way at the end of that game. His technique was good. In order to thrive as a student athlete, one must seek excellence in all aspects of life, both on the court and off. 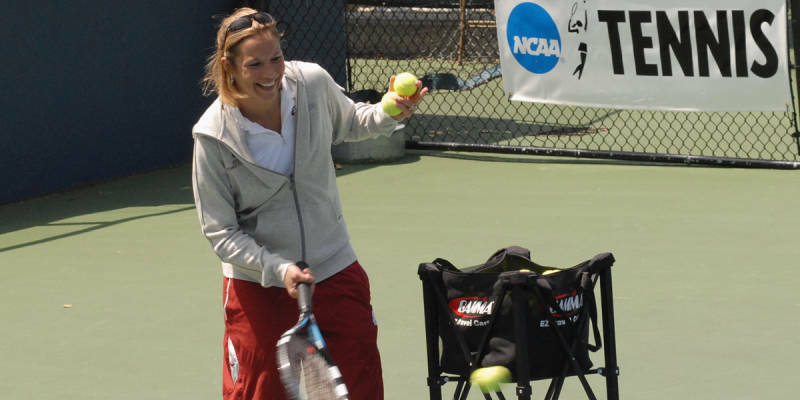 Perhaps no one realizes this better than WSU Women’s Tennis Head Coach Lisa Hart who successfully turned her competitive and academic career into a decade-long coaching tenure with the Cougars. Hart first picked up a racket at around six or seven years old. She fell in love with the sport after her brother, Brian, let her tag along to play tennis. Hart hit her stride at Sunnyside High School where she became a three-time State champion with All-American honors during her sophomore season. She played tennis collegiately at Nebraska where she was the 1995 Big Eight Freshman of the Year, a two-time all-conference team selection, and ultimately became one of the school’s winningest women’s tennis players. Her 74 career singles victories as a senior earned her No. 3 on the school’s career victories record board. She went on to win the Big 12 Conference’s No. 2 singles title. In addition to her impressive playing statistics, she received the Intercollegiate Tennis Association’s (ITA)Cissie Learie Sportsmanship Award for the Central Region and the Arthur Ashe Sportsmanship and Leadership Award during her time at Nebraska. Hart graduated from Nebraska with a bachelor’s degree in elementary education and earned a master’s in education with an emphasis in physical education and sports studies. Hart knew that coaching tennis was precisely what she wanted to do to make the most of her experience and education. Hart was also an exemplary student, earning academic all-conference selections three times and first-team academic All-Big 12 honors her senior year. Leading by example, Hart makes sure her players realize their own academic potential and reach their on-court abilities. In each of the last six seasons, the Cougars have received the ITA All-Academic team award. Having recorded 109 victories and trips to the NCAA Championships in 2008 and 2012, there’s no denying that Coach Hart has made a positive impact on the Cougar tennis program. She said she enjoys her job every day and is motivated to shape her young women into great athletes and all-around people. “I love coaching at the collegiate level because of the progress you can watch and help with. There is so much growing that happens when a young athlete comes in here at 18 and leaves when they’re 22 not only on the court but also in their lives,” Hart said. Hart says she is really excited about and proud of this year’s squad and sees big things for WSU tennis both now and in the immediate future. Luckily for Cougar sports fans, Hart seems to be the perfect fit for WSU tennis and looks to be right at home here in Pullman, where she resides with her husband John, and two young children. She has been revered for her dedication to the community during her time leading the Cougars including being a four-time recipient of the Community Service Award by the United States Tennis Association. PULLMAN, Wash. From Russia to Pullman, Liudmila Vasilieva and her tennis racket found a home away from home with the WSU tennis team. Vasilieva, a senior, will finish her impressive collegiate tennis career this year, but not before playing to reach the NCAA Tournament and break a university record. With 102 career victories, Vasilieva, known as “Luda” to her teammates and coaches, sits just six singles wins behind WSU’s all-time wins leader Elisabeth Fournier. Last week against Montana, Vasilieva earned her 100th career singles victory and became just the second WSU tennis player to reach the milestone. She followed up with singles wins against Nevada and Portland. Vasilieva attributes her success to never giving up on the court, no matter the odds. She also said setting the bar higher for herself, as well as expecting and preparing for success, has led to positive results she enjoys both on the court and in the classroom. 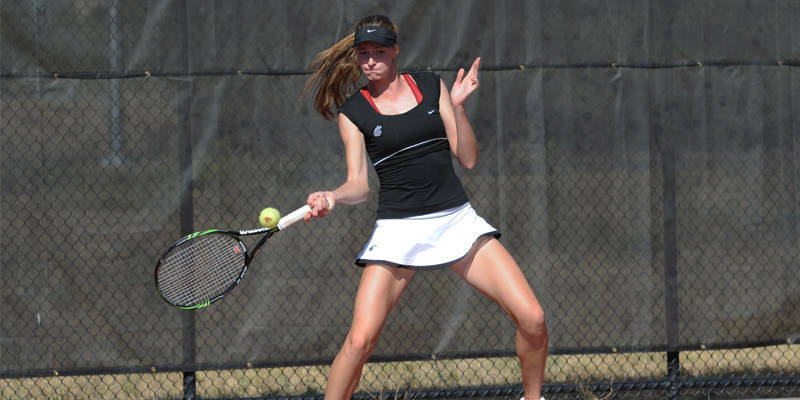 The chance to make sports history at WSU would be a privilege but Vasilieva will continue to root for future Cougar tennis players in their own endeavors, she said. Despite acknowledging that the record is indeed lingering in her mind, Vasilieva said team accomplishments such as WSU’s trip to the NCAA Championships last season mean much more to her and always come before individual accolades. Vasilieva came to Pullman from Yekaterinburg, Russia, where she first picked up a tennis racket at around seven or eight years old tagging along with her father. Making the transition from a big city populated with more than 1,000,000 people to a small college town shocked her at first, but focusing on her studies and tennis career helped to ease her through the move. “It didn’t make much of a difference because at the end of the day, I don’t have time for all the features big cities offer,” said Vasilieva. When she first started considering college, not many coaches contacted her and she received few scholarship offers to play in the United States. In fact, she nearly attended a different school altogether until current WSU Head Coach Lisa Hart personally called her to explain the benefits of Pac-12 athletics. And she does not regret her decision for a minute. Although Pullman is like a second home, she said she misses her friends, family and food in Russia. She resorts to the CUB’s offerings for lunch only when she doesn’t have the time to cook. Still, tennis drives her to work hard here at WSU. Vasilieva and the Cougar tennis team are optimistic about their chances to return to the NCAA tournament this year and go even further than last season’s finish, which was in the final 32 teams. After graduating in May, Vasilieva said she hopes to train at a tennis academy in pursuit of a professional career. She will pursue her goal to reach Fournier’s record during this weekend’s matches against Boise State in Pullman. 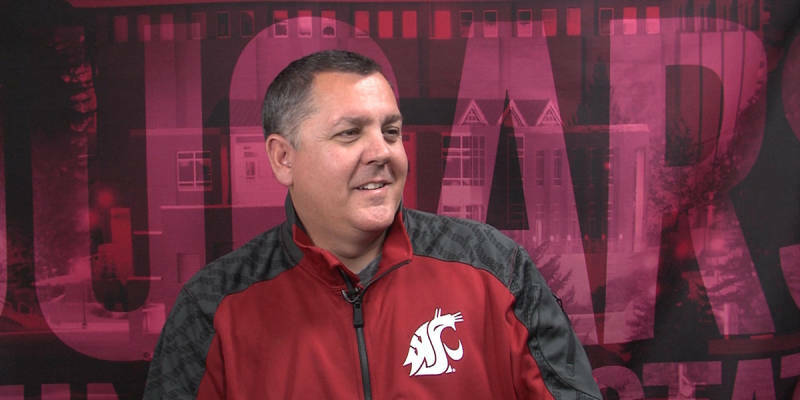 PULLMAN, Wash. From the moment he stepped on the frozen campus grounds last week, soccer Head Coach Steve Nugent could feel the family atmosphere at WSU and knew he wanted to be a part of it. Growing up in Boston, Nugent was the youngest of eight children. His upbringing combined with the present situation of raising three young boys together with his wife, Janna, have made Nugent into the staunch family man he is today. Nugent wants the teams he coaches to be bound by the similar core values and principles in that the team is family, and family always comes first. Nugent said he and his family love all the outdoor activities the West Coast has to offer and were welcomed with open arms from the first interview with WSU Athletic Director Bill Moos all the way to the day he decided to take the job as head coach. “I’m really happy to be a part of the Cougar family because everything that has happened in such a short amount of time just shows how welcoming this place is,” he said. Nugent indicated that the best part of his interview process was simply sitting down with random students in the CUB and chatting with them. Nugent brings more than 20 years of coaching experience to the Cougar soccer program at both the collegiate and club levels. Nugent said the biggest challenge of his new job will be to outwork the 11 other coaches in the Pac-12, but he’s finding it difficult to find any negatives in his new situation. “When you look at Washington State and the academic reputation of this school, the facilities, the support system, the type of athletes that coaches before me have recruited to this university, it’s setup to be successful without question,” he said. The Cougars advanced to the NCAA Championship in five of the last six seasons and finished second in the Pac-12 last year while setting or tying 28 team and individual records along the way. Previous Head Coach Keidane McAlpine departed for USC following the season. Nugent said his first order of business will be to make his players feel as comfortable as possible with him, which is a process he already initiated with a team dinner earlier this week. Nugent said he was familiar with WSU soccer prior to coming here, and he and McAlpine spoke about the ingredients it took to win both on the field and with his new players. “We have got to make sure that the players that are here and will continue on at Washington State will utilize the experience that they gained last year from an unbelievable record-breaking season with a lot of firsts,” he said. Nugent said winning a Pac-12 title and getting deeper into the NCAA Tournament is the goal right now, and his mantra on accomplishing that is simple. PULLMAN, Wash. For Washington State senior D.J. Shelton, the road to success has not always been a clear-cut path. Shelton, bounced around four different California area high schools, redshirted for Cal State Fullerton, and played one season for Citrus College before finally landing on his feet at WSU in 2011. He arrived with just three years of playing eligibility left. He said coming to WSU allowed him the chance to be featured in a big basketball program whilst letting him get away from Los Angeles to improve his gear and get his mind in the right place. With just one game remaining in his collegiate playing career, it has become obvious to both Shelton and those around him that he has undergone a great deal of growth in Pullman, both physically and mentally. “I like the fact that he’s matured on and off the court, and grown up so much as a person the last few years,” said WSU head coach Ken Bone. During a span of three seasons in Pullman, the fifth-year senior added more than 30 pounds of mass to his once slight frame. In fact, Shelton made an effort to hit the weight room harder than he ever did before after WSU’s first round exit from the Pac-12 Tournament at the hands of interstate rival Washington last season. Since then, the added weight has made the Cougars big man a force to be reckoned with on the boards. 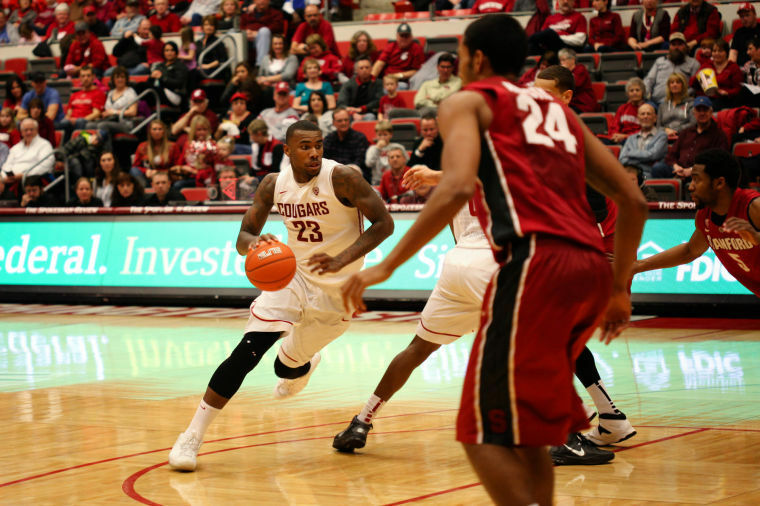 Shelton leads WSU with 261 total boards and his 9.3 rebounds per game is currently good for second in the Pac-12. “The weight I added has definitely helped me more with rebounding and finishing in the paint this season,” said Shelton. WSU head coach Ken Bone indicated that the 6’10 Shelton always had the ability to be a great rebounder but it was a specific area he wanted him to focus on. “He’s quicker than a lot of the other big guys, a good athlete, and we needed him to rebound,” said Bone. Shelton has quite the athletic pedigree with multiple members of his family tree experiencing success at both the collegiate and professional level in both football and basketball. Most notably is his uncle Lonnie Shelton who enjoyed a 10-year career in the NBA with the Knicks, Supersonics, and Cavaliers. Despite the obvious mark the Shelton family has made on the wide world of sports, D.J. said he doesn’t see any of it as a particular advantage to himself. “Well, maybe being blessed with good genes helped,” Shelton said with a laugh. Shelton said his whole family supports him and wishes him well but his greatest sports mentor has actually been his mother. “I talk to her almost every day and she helps me out and keeps my head in gear,” he said. Shelton will play his final game as a Cougar at Beasley Coliseum on Saturday against UCLA. He indicated that the days when Beasley featured packed stands, especially against U-Dub, were among his most memorable moments in college. After graduating from the basketball program and WSU as a whole, Shelton said there is absolutely no doubt he’d like to take his talents to the NBA and preferably for his hometown Lakers or Clippers in order to better provide for his family and himself. If the NBA does not work out, Shelton said he would either get his masters and go to law school or become a sports agent. “I think WSU has made me into a responsible man and prepared me well in both basketball and life,” said Shelton. SEATTLE, Wash. Former WSU placekicker Andrew Furney has been kicking all his life, but it was an abrupt positional change in high school that led to his latest gig, with the reigning Super Bowl Champion Seattle Seahawks. Furney, a lifelong soccer player, first began suiting up for organized football during his freshman year at Burlington-Edison High School in Skagit County. Regardless, Furney hung in there and the following year, something peculiar happened. Furney went on to set a state prep record with 33 career field goals at Burlington-Edison. Furney kicked in front of numerous high-profile college coaches and against some of the best kickers in the nation in an attempt to land a scholarship offer. Although he said he outperformed several talented kickers, Furney recalls being flustered with a lack of offers after the audition process was complete. Regardless, Washington State expressed serious interest in Furney’s abilities but would only offer him aid if he could win the starting job as a freshman. “That was a bit frustrating because I felt WSU would have offered me right away had I gotten competing offers from other schools,” said Furney. With few options, Furney’s hand was forced but he says he was willing to embrace the challenge of walking on at WSU because it presented him with the right opportunity he was looking for. At WSU, Furney became a folk hero of sorts. Standing 5-feet-10 inches tall and pushing a hefty 235 pounds, he was known first for his unorthodox kicker physique upon arrival. Pushed perhaps by the coaching change that brought in the hard-nosed, no-nonsense disciplinarian Mike Leach and by his own aspirations to go pro, Furney shed weight, roughly 25 pounds to a svelte 210. “For me, it was more like, ‘I don’t want to be remembered for being the big, fat kicker that kicked at Washington State,” Furney told the Seattle Times’ Bud Withers, last year. It was his consistency and a penchant for clutch kicks that helped endear Furney to football fans in the Palouse and become known as the next great Cougar kicker on a list that includes longtime NFL veterans Jason Hanson and Rian Lindell. 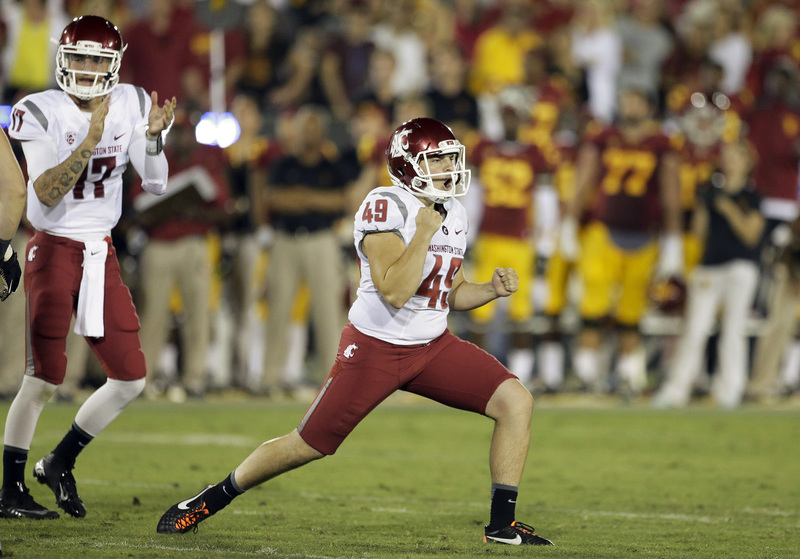 “One reason why I even came to WSU was the great tradition of kickers,” said Furney. At .714, Furney’s career percentage on kicks beyond 40 yards (15 of 21) trumps past Cougar greats like Hanson, Lindell, and Drew Dunning. As a sophomore, Furney was successful on 14-of-16 attempts and went on to sink 47 career field goals while wearing crimson and gray. Reminiscing about the 141 points worth of field goals he accumulated at WSU, Furney said the 41-yarder he hit to beat No. 25 USC in the Los Angeles Coliseum last year and the 60-yarder against Eastern Washington in 2012 were among his favorites. However, his most memorable kick was one that Cougar fans will not soon forget, the 27-yard game winner that sunk the Huskies in the 105th battle for the Apple Cup in 2012. Although a Seahawk in rookie mini camp for the time being, Furney faces extremely unlikely odds to land a roster spot with Seattle as the Seahawks signed Steven Hauschka to a three-year $9.15 million contract in March. “Realistically I just want to make a team but of course everyone would like the chance to play for their hometown team,” said Furney. Because each of the 32 NFL teams typically carries just one kicker throughout the year, Furney realizes that he needs to make the most out of each and every opportunity, even if his chance to play doesn’t necessarily come this year. When he decides to hang up the cleats for good, Furney said he’d like to utilize his business degree to follow an entrepreneurial path. “I can use my drive and creativity since I had such a diverse education and it would be kind of cool to bring all those tools together and be my own boss,” he said. PULLMAN, Wash. The 2014 NFL Draft begins on May 8 but for former Washington State safety Deone Bucannon, the path to selection at Radio City Musical Hall was carved out long ago. Bucannon, a first-team All-American and first-team All-Pac-12 selection in his senior season for the Cougars in 2013 has the chance to be the highest drafted WSU player since Marcus Trufant went 11th overall in 2003. Although he admits that he’d like to get taken as early as possible, Bucannon said he will sit back and enjoy the process no matter what happens. Throughout his collegiate playing career with the Cougars, Bucannon became well known for his penchant for big plays and reputation as one of the hardest hitters in the Pac-12. One of the better players on some poor defenses, Bucannon’s quiet confidence and leadership endeared himself to teammates, coaches, and Cougars fans alike. Bucannon was awarded the CFPA Elite Defensive Back Trophy in March after leading the Pac-12 conference with 114 tackles. “It was truly a humbling experience and an honor to be presented with the trophy due to the history behind it with all the people who won it who went on to have awesome careers,” said Bucannon. It all started for Bucannon when at he tried out flag football in second grade at the behest of his parents in order to gauge his interest and ability in the game. After that, he was finally allowed to try full contact football in Pop Warner. Bucannon initially struggled to find a position to stick with on the field and contemplated quitting the sport before ultimately listening to his mother’s advice to stick with it. He then found his true calling in getting to hit people while on defense and his admiration for the game blossomed. “I started to love football even more and the rest is history,” said Bucannon. Although he displayed impressive speed and strength, Bucannon was not very highly recruited out of Vanden High School in Fairfield, California. He received only a few offers, primarily from lower division schools aside from WSU. Rated only three stars by scouts, and ranked rather low in his positional group, Bucannon used the perceived disrespect to propel himself in college with a chip on his shoulder. Bucannon made sure he always maintained the mindset that he could one day translate his skills to the pros and establish a future for himself in the NFL and it started as early as high school. Taking these aspirations seriously meant playing on the big stage and that in turn led to Bucannon’s decision to commit to WSU, the first and only Pac-12 school to extend him an offer. Bucannon said WSU proved to be a great organization with a strong support system that guided him on his journey to reach both his academic and career goals. The consensus prognostication of draft experts on when Bucannon will be selected is in rounds 2-3 with the possibility to sneak into the late first round. Although fully aware of all the pre-draft speculation, Bucannon plans on giving it his all no matter what round he’s selected and what team he goes to. “I am thankful to even be in the conversation so there is no particular team I’d prefer to play for and I’d be more than happy anywhere I land,” he said.